Urinary tract obstructions are a common antenatal diagnosis, and outcomes range from clinically insignificant to in-utero fetal demise (IUFD). Many of these patients survive to birth but develop end-stage renal failure, requiring renal replacement therapy and, ultimately, kidney transplantation. A role for fetal intervention was originally suggested in the 1980s when Harrison’s group demonstrated that urinary diversion could hinder the progression of renal parenchymal damage. However, determining which patients would benefit from urine diversion has proved challenging and requires an extensive antenatal evaluation. This article reviews the diagnosis, evaluation, and treatment strategies for fetal urinary tract obstruction. Clinically significant urinary tract obstructions occur with a frequency of 1 in 500 live births and are associated with high morbidity and mortality. With antenatal ultrasonography, urinary tract anomalies can be detected as early as 12-14 weeks’ gestation. These anomalies can be stratified into upper urinary tract obstruction and lower urinary tract obstruction (LUTO). Common causes of upper urinary tract obstruction include ureteropelvic junction (UPJ) obstruction, ureterovesical junction obstruction, collecting system duplications, multicystic dysplastic kidney, ureterocele/ectopic ureter, and pelvic tumors. Because upper urinary tract obstruction is not currently amenable to fetal intervention, the remainder of this article focuses on LUTO. Posterior urethral valves (PUVs) account for 9% of all urinary tract obstructions and more than 50% of LUTOs. Other causes of LUTO include urethral atresia (the second most common cause), anterior urethral valves, meatal stenosis, epispadias, and hypospadias. LUTOs are far more common in males; when identified in females,they should raise suspicion for cloacal malformations. LUTO is often diagnosed with antenatal ultrasonography during the first or second trimester. Findings frequently include megacystis, bilateral hydronephrosis, pyelocaliectasis, and oligohydramnios/anhydramnios. 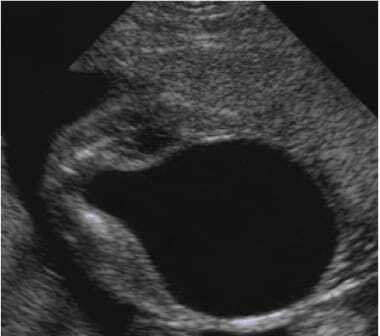 The hallmark sonographic finding of PUV is the "keyhole sign," which results from bladder and urethral distention proximal to the valve (see the image below). The presence of a normal volume of amniotic fluid suggests a partial obstruction. Further studies identified calcium, β2 -microglobulin, and total protein as being of prognostic importance. Repeated fetal urine aspirations, trending osmolarity, and sodium and chloride levels may be of use in deciding which fetuses would benefit from in-utero intervention (see Laboratory Medicine). Fetuses with favorable urine electrolyte levels and no indication of renal dysplasia are considered for vesicoamniotic shunting or fetal cystoscopy. Contraindications for fetal intervention can be either maternal or fetal. Currently, fetal intervention has no role for upper urinary tract obstruction. The algorithm for managing patients with LUTOs is illustrated in the image below. Because the role of fetoscopic cystoscopy is not yet well defined, it is not included. Treatment algorithm for fetal lower urinary tract obstructions. From The Unborn Patient: The Art and Science of Fetal Therapy (p. 272), by Johnson MP, Philadelphia: W.B. Saunders Company. 2001. Adapted with permission. Antenatal ultrasonography should first be performed to screen for associated anomalies. If no other anomalies are present, fetal karyotyping is recommended. If the patient has a normal male karyotype, the next step is to obtain serial fetal urine samples. If serial electrolyte and β2-microglobulin levels and the total protein profile are favorable, vesicoamniotic shunt placement is recommended. Deviation from this pathway portends a poor prognosis, and counseling regarding expectations is currently the best practice. In 2017, Ruano et al proposed a staging system to guide best practice. Stage I is characterized by a normal amniotic fluid index, without renal echogenicity or cortical cysts and with a favorable urinary biochemical profile, and warrants antenatal surveillance. Stage IV is suggested by in-utero renal failure, as defined by anhydramnios and renal dysplasia, and is not survivable. Stage II and III fall between these extremes and are the stages in which vesicoamniotic shunt placement plays a role. Further validation studies are needed, but this proposed staging system offers an opportunity for standardization. Antenatal ultrasonography is an essential component of the LUTO algorithm; anhydramnios poses a challenge to vesicoamniotic shunt deployment, in that the catheter requires a fluid pocket for coiling. Therefore, amnioinfusion is frequently required in severe cases. Although fetal cystoscopy does appear to result in more favorable outcomes than vesicoamniotic shunt placement, only 60 cases have been reported in the literature, and further studies are needed for validation. Harrison MR, Nakayama DK, Noall R, de Lorimier AA. Correction of congenital hydronephrosis in utero II. Decompression reverses the effects of obstruction on the fetal lung and urinary tract. J Pediatr Surg. 1982 Dec. 17 (6):965-74. [Medline]. Hofmann R, Becker T, Meyer-Wittkopf M, Tekesin I, Sierra F, Schmidt S. Fetoscopic placement of a transurethral stent for intrauterine obstructive uropathy. J Urol. 2004 Jan. 171 (1):384-6. [Medline]. Clifton MS, Harrison MR, Ball R, Lee H. Fetoscopic transuterine release of posterior urethral valves: a new technique. Fetal Diagn Ther. 2008. 23 (2):89-94. [Medline]. Johnson MP. Fetal obstructive uropathies. Harrison MR, Evans M, Adzick NS, Holzgreve W, eds. The Unborn Patient: The Art and Science of Fetal Therapy. 3rd ed. Philadelphia: WB Saunders; 2001. 259-86. Merguerian PA. 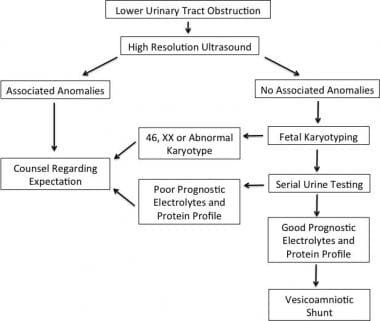 The evaluation of prenatally detected hydronephrosis: pitfalls in available diagnostic tools and current recommendations. Monogr Urol. 1995. 16:3. Quintero RA, Johnson MP, Romero R, Smith C, Arias F, Guevara-Zuloaga F, et al. In-utero percutaneous cystoscopy in the management of fetal lower obstructive uropathy. Lancet. 1995 Aug 26. 346 (8974):537-40. [Medline]. Mahony BS, Callen PW, Filly RA. Fetal urethral obstruction: US evaluation. Radiology. 1985 Oct. 157 (1):221-4. [Medline]. Chinn DH, Filly RA. Ultrasound diagnosis of fetal genitourinary tract anomalies. Urol Radiol. 1982. 4 (2-3):115-23. [Medline]. Crombleholme TM, Harrison MR, Longaker MT, Langer JC. Prenatal diagnosis and management of bilateral hydronephrosis. Pediatr Nephrol. 1988 Jul. 2 (3):334-42. [Medline]. Kramer SA. Current status of fetal intervention for congenital hydronephrosis. J Urol. 1983 Oct. 130 (4):641-6. [Medline]. Glick PL, Harrison MR, Golbus MS, Adzick NS, Filly RA, Callen PW, et al. Management of the fetus with congenital hydronephrosis II: Prognostic criteria and selection for treatment. J Pediatr Surg. 1985 Aug. 20 (4):376-87. [Medline]. Harrison MR, Golbus MS, Filly RA, Callen PW, Katz M, de Lorimier AA, et al. Fetal surgery for congenital hydronephrosis. N Engl J Med. 1982 Mar 11. 306 (10):591-3. [Medline]. Harrison MR, Ross N, Noall R, de Lorimier AA. Correction of congenital hydronephrosis in utero. I. The model: fetal urethral obstruction produces hydronephrosis and pulmonary hypoplasia in fetal lambs. J Pediatr Surg. 1983 Jun. 18 (3):247-56. [Medline]. Adzick NS, Harrison MR, Flake AW, Laberge JM. Development of a fetal renal function test using endogenous creatinine clearance. J Pediatr Surg. 1985 Dec. 20 (6):602-7. [Medline]. Ruano R, Dunn T, Braun MC, Angelo JR, Safdar A. Lower urinary tract obstruction: fetal intervention based on prenatal staging. Pediatr Nephrol. 2017 Jul 21. [Medline]. Morris R et al. Congenital lower urinary tract obstruction and the efficacy of vesico-amniotic shunting. Studd J, Tan SL, Chervenak F, eds. Progress in Obstetrics and Gynaecology. London: Elsevier; 2006. Vol 17: 78-97. Nakayama DK, Harrison MR, de Lorimier AA. Prognosis of posterior urethral valves presenting at birth. J Pediatr Surg. 1986 Jan. 21 (1):43-5. [Medline]. Parkhouse HF, Barratt TM, Dillon MJ, Duffy PG, Fay J, Ransley PG, et al. Long-term outcome of boys with posterior urethral valves. Br J Urol. 1988 Jul. 62 (1):59-62. [Medline]. Johnson MP, Danzer E, Koh J, Polzin W, Harman C, O'Shaughnessy R, et al. Natural History of Fetal Lower Urinary Tract Obstruction with Normal Amniotic Fluid Volume at Initial Diagnosis. Fetal Diagn Ther. 2017 Jul 13. [Medline]. Nassr AA, Shazly SAM, Abdelmagied AM, Araujo Júnior E, Tonni G, Kilby MD, et al. Effectiveness of vesicoamniotic shunt in fetuses with congenital lower urinary tract obstruction: an updated systematic review and meta-analysis. Ultrasound Obstet Gynecol. 2017 Jun. 49 (6):696-703. [Medline]. Coplen DE. Prenatal intervention for hydronephrosis. J Urol. 1997 Jun. 157 (6):2270-7. [Medline]. Ruano R. Fetal surgery for severe lower urinary tract obstruction. Prenat Diagn. 2011 Jul. 31 (7):667-74. [Medline]. Sananes N, Cruz-Martinez R, Favre R, Ordorica-Flores R, Moog R, Zaloszy A, et al. Two-year outcomes after diagnostic and therapeutic fetal cystoscopy for lower urinary tract obstruction. Prenat Diagn. 2016 Apr. 36 (4):297-303. [Medline].